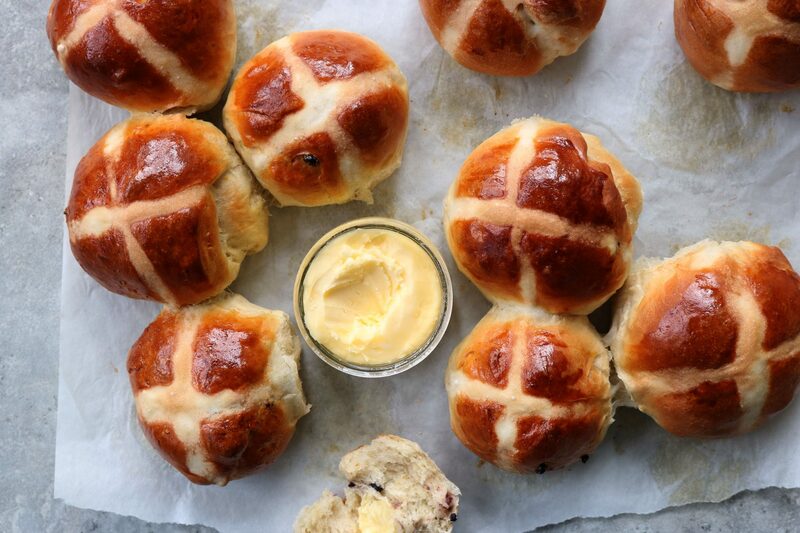 My three favourite ways to eat hot cross buns are as follows: 1) warm, straight from the oven, with butter. 2) pulled in half (not sliced, so you get the craggy edges) and toasted, with butter. 3) buttered and stuffed with aged cheddar or Gouda or whatever cheese you happen to be loving at the moment, for breakfast, lunch or dinner. It occurred to me yesterday, when I realized it was a week from Easter and spontaneously decided to make a batch of hot cross buns, that there aren’t a huge number of recipes out there for them – it doesn’t seem to be a staple in baking books, so I went back to my old standby. They’re fairly simple to mix together, as yeast doughs go-it’s a nice buttery one, flavoured with orange zest and studded with currants or raisins. If you like candied peel, and can find some good stuff, go for it-I tend to leave it out and rely on lots of cinnamon and orange zest or even a big spoonful of chunky orange marmalade in the dough (replace some of the sugar). The dough is easy to mix – if they’re intended for breakfast, you can shape the buns, cover and refrigerate them overnight to slow the rise. A little beaten egg right before they go into the oven makes them glossy. And while some pipe icing crosses onto their baked, cooled buns, there are two reasons I like to add a flour-water paste before they go into the oven: I like that they bake right on, and don’t get sticky, and I like to eat these warm, which would mean the icing would melt and slide off unless I waited until they cooled completely. If you want to go the icing route, by all means skip the flour-water paste and pipe on whatever icing/drizzle you like. 1In a large bowl, dissolve the yeast in 1/4 cup warm water, along with a pinch of the sugar. (If it doesn't get foamy, you need new yeast!) Add the milk and about 3 cups of flour along with the rest of the sugar, the butter, egg, orange zest, cinnamon and salt. Stir or knead with the hook attachment of your stand mixer until you have a soft, sticky dough. Add the remaining flour, if you need it-the dough should be soft and tacky, but not overly sticky. Cover the bowl and leave it for an hour or so, until it has doubled in size. 2Turn the dough out onto the countertop, spread it out a bit and sprinkle with the currants. Fold the dough over itself and knead a few times to incorporate the currants into the dough. Divide the dough into 12 pieces and shape each into a rough ball. Place on a parchment-lined baking sheet or into a 9x13-inch baking pan, cover and set aside for another hour. 3When you're ready to bake, preheat the oven to 375F. Brush the buns with some beaten egg, and in a small dish, stir together the flour and water to make a smooth paste. Spoon into a small zip-lock bag, seal and snip off one corner; squeeze over the buns to make crosses. Bake for about 20 minutes, until deep golden. Serve warm. Makes 1 dozen hot cross buns. Really delicious! And I didn’t miss the candied peel one bit – the orange zest works so well. OMG…… I thought I was the only one who loves hot cross buns topped with cheddar cheese. I split the buns and butter them, the put them in a skillet, buttered side down, until golden brown and toasted. Then top with cheddar. Yum. I also like my bran muffins cut and buttered and served with cheddar. Can’t wait to make these on Friday. Thanks for posting. Happy Easter to you and your family. 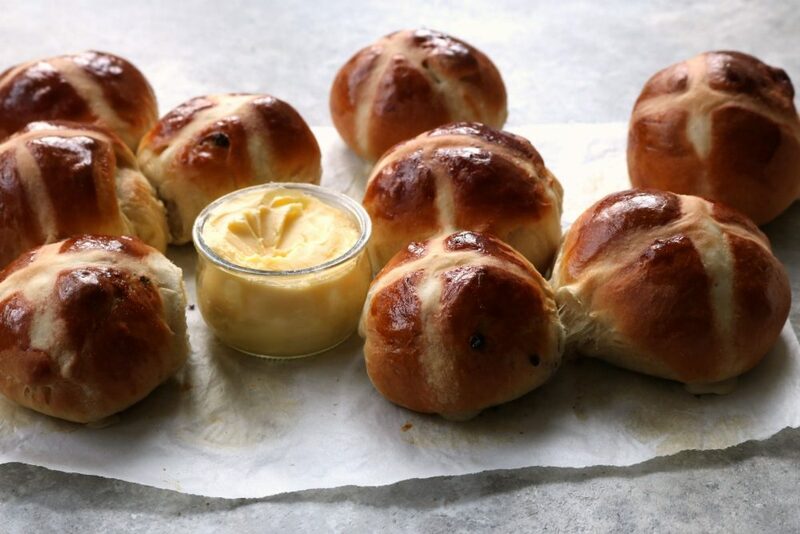 Hi Julie, just took these delightful hot cross buns out of the oven, delicious with a chunk of old cheddar. Thanks for the simple recipe, used dried cranberries , dried apricots and a generous spoonful of marmalade, a dynamite combination.. The rest of the sugar gets added with the flour? I made these last week and just added the sugar at that time but noticed today that it isn’t actually specified. Delicious buns! Thank you! Made these today! Thank-you Interested but shy , I read the recipe at least 10 x to see if I missed something, but just figured that adding the sugar at the same time as the flour made sense. Im a newbie baker! Great recipe! I was so happy to see your substitutions. I used Lime marmalade and a little candied ginger.